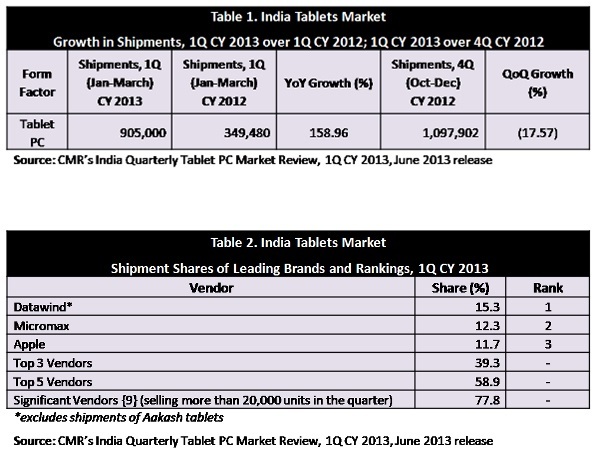 We know that smartphone adopting is growing fast in India — particularly for the iPhone — but what about tablets? They’re growing too, albeit at a lesser rate, with Apple ranked third behind local players Micromax and Datawind, according to a new report. CyberMedia Research estimates that shipments of tablet devices during the first quarter of 2013 jumped 159 percent year-on-year to account for 905,000 units. That’s actually a drop of 18 percent from the final quarter of 2012, the period was peak time due to Christmas and the end of the year, so a direct comparison is a little off. The latest report from CyberMedia found that a whopping 53 domestic and international companies distributed tablets across India — demonstrating the surge, particularly in affordable devices — however just nine firms “shipped in significant volumes of more than 20,000 units during the period”. Of them, Canadian-Indian firm Datawind was top with 15.3 percent market share, though notably shipments did not include numbers for the Akash, the sub-$50 tablet built with support from the Indian government that is still to bear fruit. Local electronics maker Micromax came in second with a 12.3 percent share, while Apple completed with top three with 11.7 percent. The top three accounted for less than 40 percent of shipments, demonstrating the breadth of firms competing in India’s tablet market. CyberMedia did not break the figures down by screen-size, price or operating system, so the data doesn’t lend itself to a great deal of further analysis of types of tablets that are proving popular. However, we can assume that the lion’s share are low- to mid-range as evidenced by the number of manufacturers, and the reasonably flat market share across the industry. Apple has used aggressive sales tactics, like interest free repayment deals, to grow its smartphone sales by 400 percent, but the tablet market is a different space altogether. Phones are ubiquitous — India is one country with more registered numbers than people — but a tablet isn’t as necessary as phone, and for many it’s a luxury item that they can’t afford or don’t feel they need. Consumer attitudes will change and tablets are likely to become more popular in India, but, for now at least, smartphones are leading the country’s tech race by some way.